Mangroves are an important part of estuarine food webs, producing large amounts of leaf litter. Leaves drop from the mangrove trees and are quickly decomposed by fungi and bacteria. This decomposed matter is referred to as detritus which is flushed into the estuary by the outgoing tides. This provides a food source for marine life including economically important shrimp, crabs, and fish. An estimated 75% of the game fish and 90% of the commercial species in south Florida are dependent upon the mangrove system during at least part of their life cycles. Algae play a vital role in mangrove community food webs. 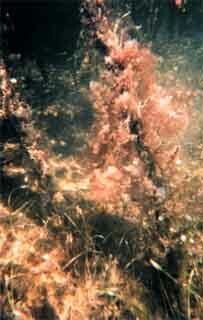 Many organisms feed directly on micro and macroalgae that thrive within mangrove communities. The aerial root systems of mangrove trees provide a hard substrate for the attachment of epiphytic algae such as diatoms and blue-green algae. Phytoplankton is an important component of mangrove systems. Species richness is dependent upon the primary source of water and salinity levels as well as seasonal and daily environmental fluctuations. The majority of phytoplankton is washed into the mangroves from adjacent areas, including open ocean, freshwater, and estuarine environments. Mangroves offer both hard and soft bottom habitats for a diversity of invertebrate life. The extensive root systems, muddy bottoms, and open waters are all home to invertebrates that are well adapted to the temperature and salinity variations as well as tidal influences common to mangroves. These invertebrates feed on leaf litter, detritus, plankton, and other small animals. Snails, barnacles, bryozoans, tunicates, mollusks, sponges, polychaete worms, isopods, amphipods, shrimps, crabs, and jellyfish all live either on or in close proximity to mangrove root systems. Some invertebrates thrive in the mangrove canopy, of which the most abundant are the crabs. The mangrove tree crab, Aratus pisoni, resides in the canopy, feeding primarily on red mangrove leaves. Other crabs live in the intertidal mud flats, utilizing leaf litter and detritus as a food source. Horseshoe crabs are scavengers and may be found among mangroves feeding on algae, invertebrates, and dead organisms. They are especially adapted to low oxygen waters, possessing up to 200 book gills used for respiration. The fishes found in south Florida mangroves represent marine species present in the Florida Bay along with the inclusion of freshwater species. During the rainy season, the increased flow of freshwater results in the appearance of freshwater species. However, the majority of dry season species cannot survive in these low salinities and migrate to higher salinity areas offshore. 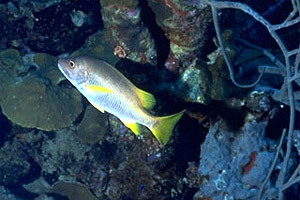 Some marine species, such as snook (Centropomus undecimalis), prefer the lower salinity, remaining in the mangroves during the entire year. Mangrove roots provide an ecologically important habitat for a wide variety of fish. Jacks (Caranx spp. ), sheepshead (Archosargus probatocephalus), grunts (Haemulon spp. ), gobies (Gobiosoma spp. ), schoolmasters (Lutjanus apodus), gray snappers (Lutjanus griseus), and small goliath grouper (Epinephelus itajara) as well as many other species of fish can be found among the tangled roots of red mangroves. Tarpon (Megalops atlanticus) cruise in waters adjacent to mangrove roots. The spotted seatrout (Cynoscion nebulosus) also thrive in mangroves and can tolerate high turbidity, taking advantage of the prey fish in the mangroves and seagrass beds. 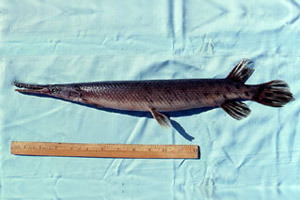 The florida gar (Lepisosteus platyrhincus) is a top-level carnivore, feeding on a variety of smaller fishes. Mangroves are important nursery areas for the sport and commercial fishing industry. 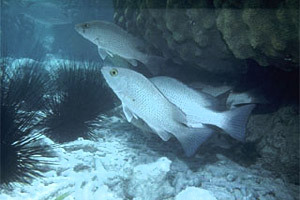 Gray snapper (Lutjanus griseus), spotted seatrout (Cynoscion nebulosus), and red drum (Sciaenops ocellatus) are among the species that utilize the mangrove primarily as nursery areas. The mangrove roots and shallow waters offer shelter from predators until the juveniles reach a size large enough to avoid most predators. These three species mentioned above are highly prized by sport fishers. As mangrove habitats are destroyed, the sport and commercial fisheries decline as a direct result. American alligators (Alligator mississippiensis) and American crocodiles (Crocodylus acutus) are both residents of mangrove habitats. The American alligator ranges throughout the southeastern U.S., and is found only in low salinity areas of Florida mangroves. On the other hand, the American crocodile is quite rare, relying heavily on mangrove habitats for their survival. In recent years, the range of this reptile has decreased considerably due to destruction of habitat and increase in human activity within the Florida Keys. The American crocodile now occurs in the north Florida Bay and nearby swamps, as well as the north end of Key Largo. Nine species of snakes reside in the mangroves of Florida. Anoles, including the green anole (Anolis carolinenesis), brown anole (Anolis sagrei), and the bark anole (Anolis distichus), reside in the trees within mangroves, feeding on insects. Freshwater species of turtles are found near the headwaters of mangrove river systems. The ornate diamondback terrapin (Malaclemys terrapin macrospilota and M. t. rhizophorarum) relies upon mangroves as its primary habitat along with three other species of freshwater turtles occur in mangroves. Also associated with mangrove vegetation during at least some point in their life histories are sea turtles. The loggerhead (Caretta caretta) and green sea turtle (Chelonia mydas) utilize the mangroves as juvenile nurseries, receiving protection from predators as well as an area rich in food. The green sea turtle and Hawksbill sea turtles (Eretmochelys imbricata) have been observed feeding on mangrove roots and associated submerged vegetation. The Atlantic ridley sea turtle (Lepidochelys kempii) is commonly observed in the mangrove-lined bays of south Florida. Only three species of amphibians are known to occur in mangroves. This is due to the inability of osmoregulatation in saltwater as well as lack of detailed surveys in low salinity regions within mangrove systems. The occurrence of more amphibian species within this habitat is highly suspected, although unknown at this time. The mangroves of south Florida provide a habitat for many bird species. The shallow waters and exposed mudflats of the mangroves make this habitat ideal for probing shoreline birds such as plovers and sandpipers. Long-legged wading birds utilize these and deeper waters along mangrove-lined waterways. Herons, egrets, bitterns, spoonbills, limpkins, and ibis are among the wading birds that visit mangroves in search of food. White Ibis (Eudocimus albus) feed on crabs while the roseate spoonbill (Ajaia ajaja) preys on mollusks and other invertebrates living within the sediments. Yellow-crowned night herons (Nyctasnassa violacea) and American bitterns (Botaurus lentiginosus) feed on a variety of prey, including crabs, crayfish, frogs and mice as well as small fishes. Mangroves also provide breeding habitat for wading birds. The entire Everglades population of the wood stork nests only in mangroves. Twenty-nine species of ducks, grebes, loons, cormorants, and gallinules have been observed in the mangrove habitats of south Florida. These floating/diving birds feed on fishes, plant materials, and invertebrates. Some of these waterfowl are year round residents, while others occur during migration or as winter visitors. Birds of prey include permanent residents, summer residents, and winter visitors of mangrove habitats. The southern bald eagle (Haliaeetus leucocephalus leucocephalus), osprey (Pandion haliaetus), and peregrine falcon (Falco columbarius) depend upon mangroves for their survival in south Florida. The bald eagle and osprey feed extensively on the fishes that occur in mangroves. These species also roost and nest within the mangrove tree canopy. The Florida panther is rarely observed, however most of the recent sightings have been within the everglades mangrove systems. Only 50-60 panthers remain in Florida – the greatest threat to this critically endangered cat is habitat destruction. Coastal hammocks and mangroves are vital for the continued survival of this panther. Marine mammals found along mangrove-lined waterways include bottlenose dolphins (Tursiops truncatus) and manatees (Trichechus manatus). Dolphins feed on fishes associated with mangrove systems. As an herbivore, the manatee feeds on seagrasses and other submerged aquatic plants found outside mangroves. However, manatees are frequently observed swimming in canals, coastal rivers, and other waters close in proximity to mangroves. estuary: area where freshwater meets the sea, creating a salinity gradient from pure freshwater (0 ppt) to full-strength seawater (35 ppt). plankton: organisms dependent on water movement and currents as their means of transportation, including phytoplankton, zooplankton, and ichthyoplankton. salinity: concentration of total salts dissolved in water, usually measured in parts per thousand. polychaete: class of annelid worms that includes bristle and feather duster worms. canopy: uppermost layer of branches in a forest. intertidal: the area also known as the littoral zone which is covered by water during high tide and exposed at low tide. population: a group of interacting individuals of the same species, area, or community.